MacRumors is reporting that the new book Insanely Simple: The Obsession That Drives Apple’s Success mentions Steve Jobs was looking to do a Willy Wonka like promotion for the sale of the 1 millionth iMac. I find this so hard to believe, but I so want it to be true. Apple in many ways is like Wonka. It’s secretive, nobody knows how the popular products come out, it’s founder was fanatic about privacy, secrecy and was without question a little quirky and eccentric. 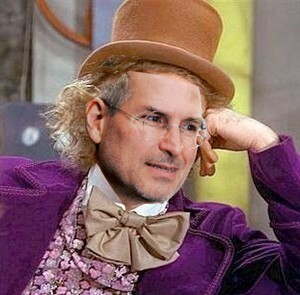 In many ways, Steve Jobs was like Willy Wonka. Whomever would have went on the tour would have had one heck of an experience to talk about. Just remember: Don’t touch the fizzy lifting drinks. He hasn’t perfect it just yet.